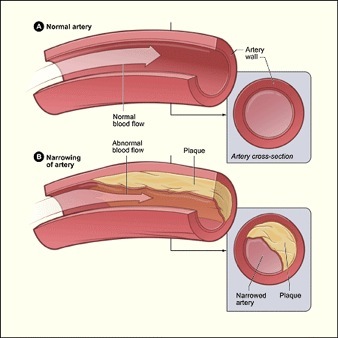 Coronary artery disease (CAD) is a condition in which plaque builds up inside the coronary arteries. These arteries supply your heart muscle with oxygen-rich blood. Over time, CAD can weaken the heart muscle and lead to heart failure and arrhythmias. Heart failure is a condition in which your heart can't pump enough blood throughout your body. Arrhythmias are problems with the speed or rhythm of your heartbeat. CAD is the most common type of heart disease. It's the leading cause of death in the United States for both men and women. Lifestyle changes, medicines, and/or medical procedures can effectively prevent or treat CAD in most people. When damage occurs, your body starts a healing process. Excess fatty tissues release compounds that promote this process. This healing causes plaque to build up where the arteries are damaged. Plaque also can crack, which causes blood cells called platelets to clump together and form blood clots at the site of the cracks. This narrows the arteries more and worsens angina or causes a heart attack. Coronary artery disease (CAD) is the leading cause of death in the United States for both men and women. Each year, more than half a million Americans die from CAD. Certain traits, conditions, or habits may raise your chance of developing CAD. These conditions are known as risk factors. You can control most risk factors and help prevent or delay CAD. Other risk factors can't be controlled. Many factors raise the risk of developing CAD. The more risk factors you have, the greater chance you have of developing CAD. A common symptom of coronary artery disease (CAD) is angina. Angina is chest pain or discomfort that occurs when your heart muscle doesn't get enough oxygen-rich blood. This may feel like pressure or a squeezing pain in your chest. You also may feel it in your shoulders, arms, neck, jaw, or back. This pain tends to get worse with activity and go away when you rest. Emotional stress also can trigger the pain. The severity of these symptoms varies. The symptoms may get more severe as the buildup of plaque continues to narrow the coronary arteries. Some people who have CAD have no signs or symptoms. This is called silent CAD. It may not be diagnosed until a person shows signs and symptoms of a heart attack, heart failure, or an arrhythmia (an irregular heartbeat). 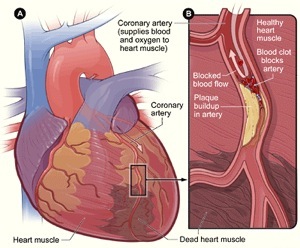 A heart attack happens when an area of plaque in a coronary artery breaks apart, causing a blood clot to form. The blood clot cuts off most or all blood to the part of the heart muscle that's fed by that artery. Cells in the heart muscle die because they don't receive enough oxygen-rich blood. This can cause lasting damage to your heart. (dead heart muscle) caused by a heart attack. with plaque buildup and a blood clot. Heart failure is a condition in which your heart can't pump enough blood to your body. Heart failure doesn't mean that your heart has stopped or is about to stop working. It means that your heart can't fill with enough blood or pump with enough force or both. This causes you to have shortness of breath and fatigue that tends to increase with activity. Heart failure also can cause swelling in your feet, ankles, legs and abdomen. An arrhythmia is a problem with the speed or rhythm of the heartbeat. When you have an arrhythmia, you may notice that your heart is skipping beats or beating too fast. Some people describe arrhythmias as a fluttering feeling in their chests. These feelings are called palpitations. Some arrhythmias can cause your heart to suddenly stop beating. This condition is called sudden cardiac arrest (SCA). SCA can make you faint and it can cause death if it's not treated right away. Treatment for coronary artery disease (CAD) may include lifestyle changes, medicines and medical procedures. Follow a heart healthy eating plan. Increase your physical activity (check with your doctor first). Lose weight, if you're overweight or obese. Quit smoking, if you smoke. Avoid exposure to secondhand smoke. Learn to cope with and reduce stress. You and your doctor can discuss which treatment is right for you. Your doctor may prescribe cardiac rehabilitation (rehab) for angina or after CABG, angioplasty, or a heart attack. Cardiac rehab, when combined with medicine and surgical treatments, can help you recover faster, feel better, and develop a healthier lifestyle. Almost everyone with CAD can benefit from cardiac rehab. The cardiac rehab team may include doctors, nurses, exercise specialists, physical and occupational therapists, dietitians, and psychologists or other behavioral therapists. Exercise training. This part helps you learn how to exercise safely, strengthen your muscles, and improve your stamina. Your exercise plan will be based on your individual abilities, needs, and interests.  Education, counseling and training. This part of rehab helps you understand your heart condition and find ways to reduce your risk for future heart problems. The cardiac rehab team will help you learn how to cope with the stress of adjusting to a new lifestyle and with your fears about the future. 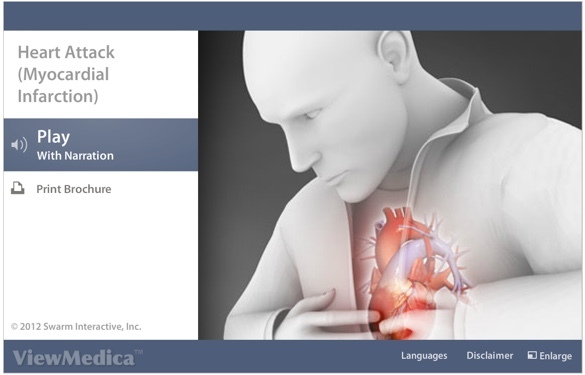 More information is available on the Cardiovascular Center Coronary Artery Disease (CAD) website page.